The Kia Rio has traditionally been this Korean automaker's least expensive model. Early on, the Rio represented an affordable, though pretty forgettable, mode of transportation. The second-generation model represented a marked improvement in features and comfort, and the Rio became more pleasant to drive. 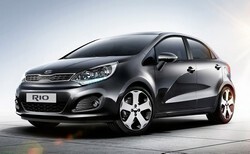 The latest Rio is another leap forward thanks to its evocative styling, peppy engine and an abundance of interior space. The Kia Rio is offered in both sedan and four-door hatchback body styles. They have identical mechanicals and interior components, though the hatchback offers significantly more utility. In general, the newer the Rio you're looking at, the better it will be. The fourth-generation Kia Rio, revealed at the 2011 Geneva Motor Show, boasts a bold and distinctive personality, bringing the latest model into line with the rest of Kia's striking design-led product range. In addition to appealing to consumers' aesthetic tastes, the new Kia Rio will spearhead the company's efforts to significantly grow its market share across the globe by offering potential owners industry-leading environmental credentials. The 2006 Rio sedan and Rio5 five-door are raising the bar in the entry level segment by offering class-leading horsepower and interior volume, and six standard airbags, including full-length side-curtain airbags. New from the ground up, the Rio and Rio5's longer wheelbase and increased width and height contribute to a best-in-class 92.2 cubic feet of passenger room and both body styles feature a long list of standard equipment that are sure to increase their appeal in the U.S. market.